Aug. 30, 7:45 AM – Another foggy morning. Can’t see Mt. Ranier. This is the La Quinta in Seattle again, so we’ll be going to the Denny’s next door for breakfast. The difference in motels is almost amusing. This lobby is palatial by comparison to the Best Western in Everett, and the beds are the best ever. But the towels are thin and rough, there’s only a cold continental breakfast, and no in-room fridge or microwave. The BW had it all, including soft, thick towels and a sumptuous breakfast buffet. But both have what we came for: Cool Temps! Aug. 30, 8:30 AM – Rain! Well, okay. Drizzle. Not enough to bottle and take home. Here we are ready to leave for the airport and NOW Seattle starts acting like Seattle! No matter. It’s about 57 degrees, and the air is filled with the bracing scent of evergreens and spicy cedar. I don’t wanna leave! Aug. 30,10:30 AM – At SeaTac airport. Slowed up the security process by neglecting to remove my laptop from its case. Coulda swore I read somewhere that it wasn’t necessary anymore. Husband thoroughly ticked. Aug. 30, 8:00 PM – and home. We were immediately flattened by the oppressive heat coming out on the jet way. Two good things: Everything in my suitcase smells like evergreens and the gourmet coffees I picked up in Everett; and the rain gauge showed 2 ¼ inches. Can you believe that? Guess it took us leaving this super heated, drought-ridden area to make it rain! Also, the publicists at VerveStar report progress on my new Ammanon.com page. Now I’m getting excited again about the impending fall re-release of Book One. Ready to get back to work! Aug. 29, 7:30 AM – Now this is the kind of day we were expecting up here: heavily overcast. That’s what you always hear about Seattle, right? Gray and rainy. I promised the home folks I’d return with bottles of rain, proof that the stuff still exists somewhere on the planet. But until this morning it’s been bright and sunny. Nary a drop of rain in sight. And there still isn’t. Nevertheless, we got what we really came for: blissfully cool, blessedly sane, weather! 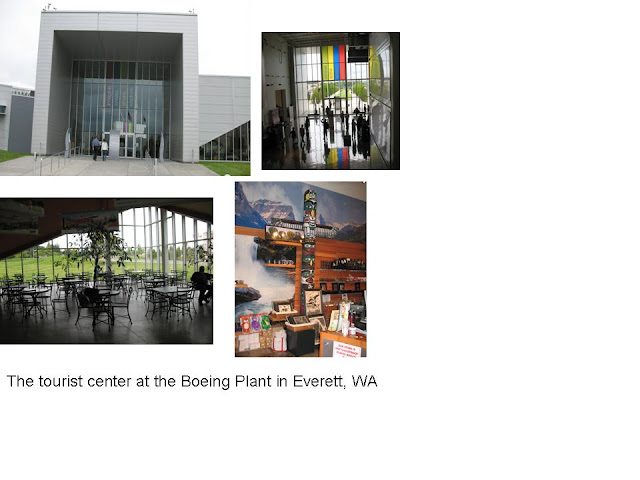 Aug. 29, noon – Toured the Boeing plant today! The factory here in Everett is the largest building by volume in the United States. I can’t remember the exact figure, but the square footage runs into the millions. The place is gratifyingly busy with over 3000 employees working 24/7. If you were to order a 787-8 right now, you wouldn’t get it until 2020. 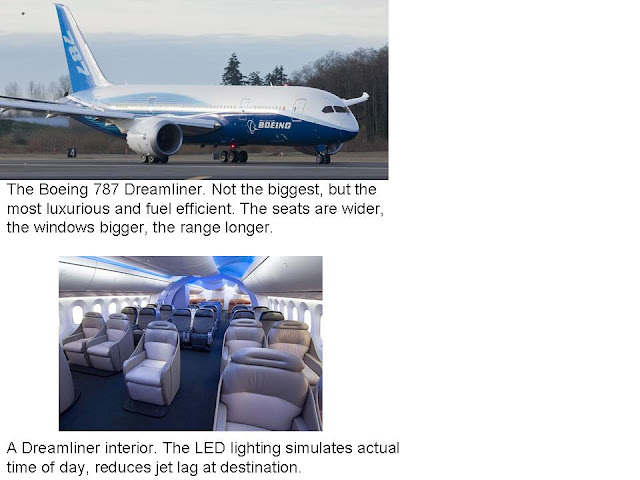 So it seems Boeing ain’t hurtin’ as much as the rest of the economy. No cameras, purses, fanny packs, cell phones, or electronics of any kind are allowed on the tour. (You have to rent a locker to stash your stuff.) So I can’t show you the monstrous 747s being assembled on the cavernous factory floor. Or the luxurious interior of the 787 Dreamliner commissioned by Korean Air. 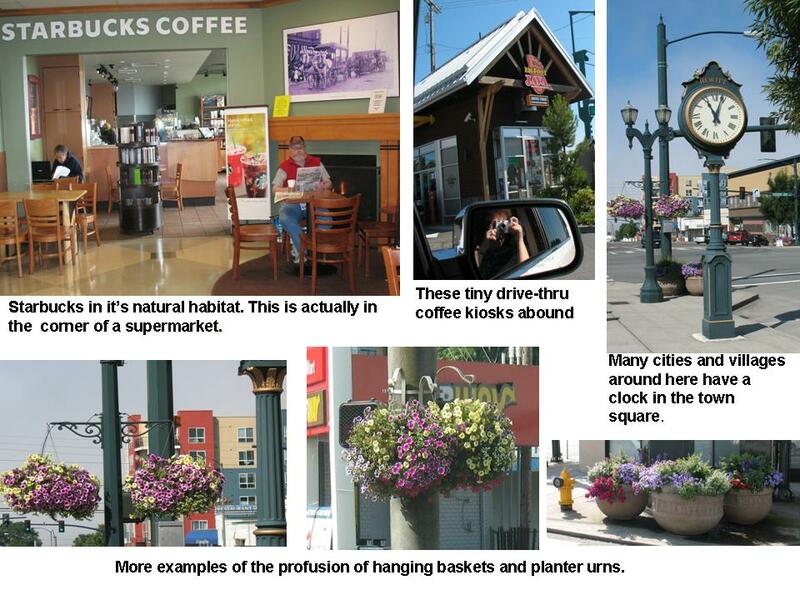 Positioning pics in this blog is terribly tricky. That’s why I resorted to PowerPoint to position them en masse. But that’s not great, either. 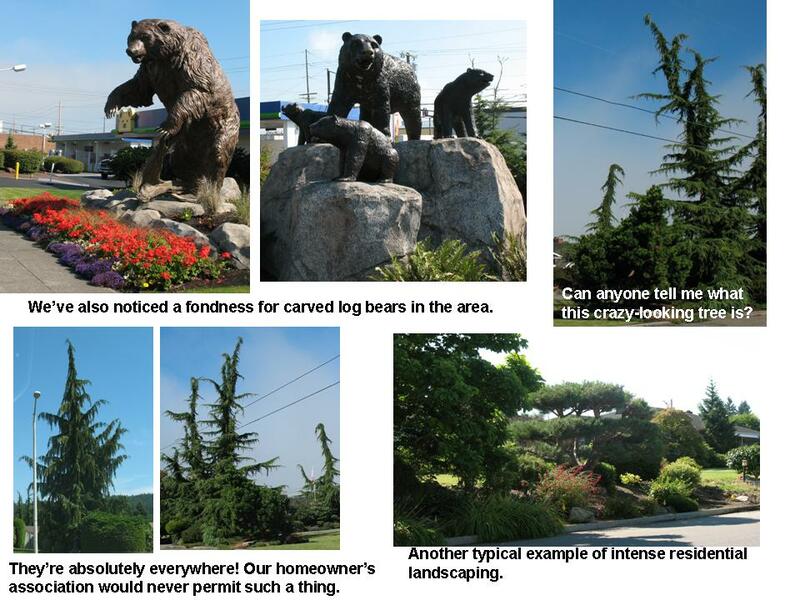 Bear with me, folks. I’ll figure it out sooner or later. 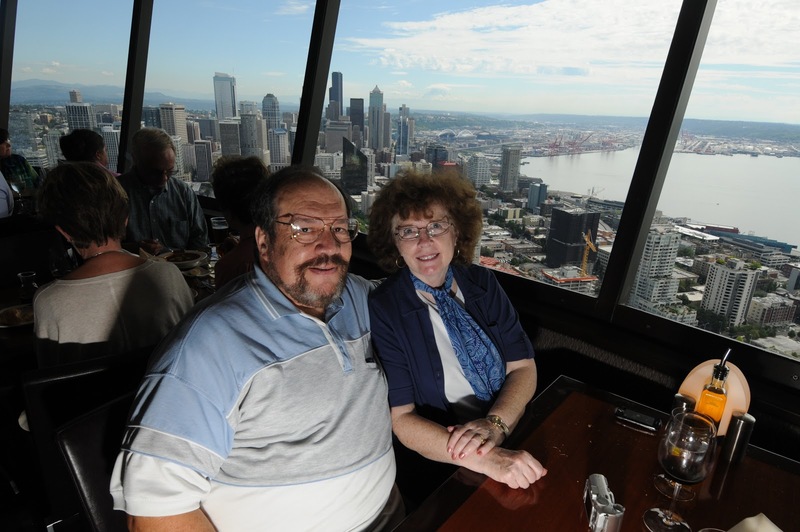 Aug. 29, 4:00 PM – We moved from Everett back to Seattle before our flight tomorrow. As I’ve mentioned, traffic around here is even worse than Houston’s. This motel is just a few miles from the airport. Husband is eager to get home. He’s got fall tomatoes planted. Me, I can’t imagine returning to the fiery, unrelenting heat of Texas after this brisk, exhilarating evergreen air. But we can’t have it all, can we? Aug. 28, 9:22 AM - No scenery today! We’re socked in with fog. Nevertheless we’re thoroughly enjoying the glorious cool. Husband has the windows open to the 55-degree euphoria. I was up around 7 AM when it was even cooler, walking laps around the motel before coffee. Speaking of which, we’re about to head to the supermarket up the street. Last time we were there Husband noted they had a coffee collection I may wish to explore. Would I ever! Then maybe some more shots of local color. 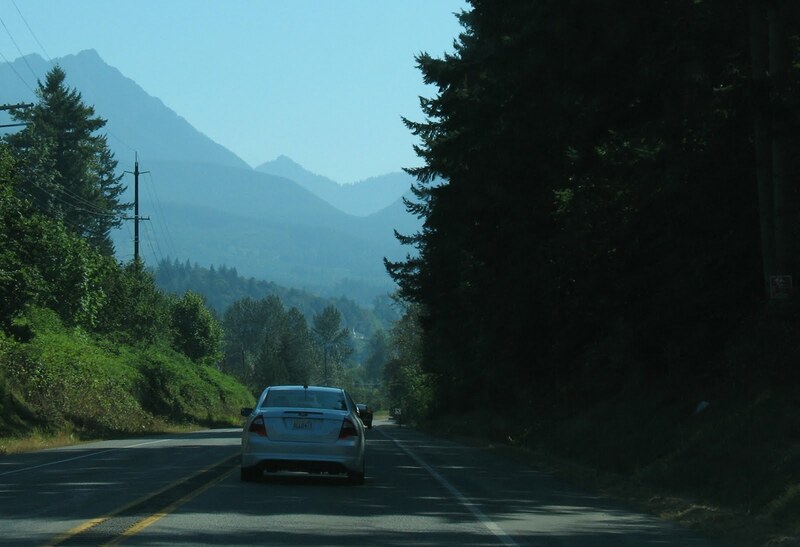 Aug. 28, 6:45 PM – More local color, more mountain driving! 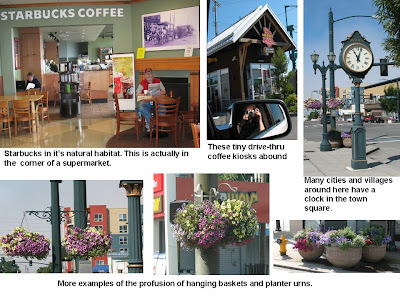 Let me put together another PowerPoint photo essay here. Aug. 27, 10:00 PM - Today I’d planned to post a gallery of local color. Between struggling with maps and GPS gadgets, however, I didn’t get nearly the shots I wanted. Well, maybe tomorrow. I’m really blown away by the floral sense of this area. Even the more modest homes have showplace yards: sculpted greenery and brilliant colors. They have flowers here I’ve never seen before. 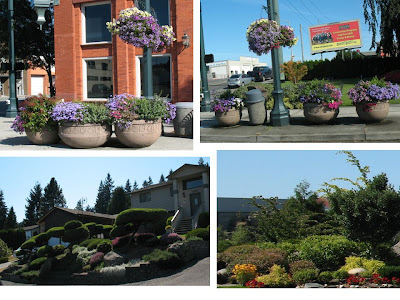 Seattle, Everett, and all the towns we’ve wandered through maintain bowers of flowers along roadways, colorful hanging baskets from light poles, and planter urns on every corner. Sightseeing was the main thing today, but we also spent an unreal amount of time trying to find a steak house. I mean, we’re from the Gulf Coast, okay? Seafood – even that unique to the area – gets old after a bit. We found three steak places. One didn’t open until evening. The second wasn’t even there. The last was run like Burger King: place your order at the counter and find a seat. Not exactly what we had in mind. So where did we end up? A Mexican restaurant. Yes. We Texans come within a stone’s throw of Canada and go to a Mexican restaurant. They’re everywhere up here. More than in Houston. Okay, I’ve got it now. The internet crashes every evening between 6:30 and 7 PM. I confirmed it at the front desk. So I’d better get busy here! 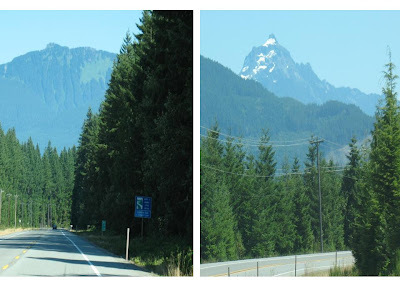 Aug. 26, 6:15 PM – Today we headed east out of Everett on US 2, the lower loop through the Cascade Range. 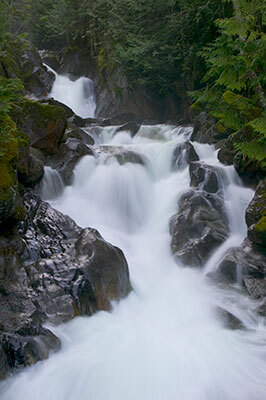 Again the drive offered spectacular views, but this time we pulled off at Deception Falls to marvel at the rushing water and take a woodland hike. 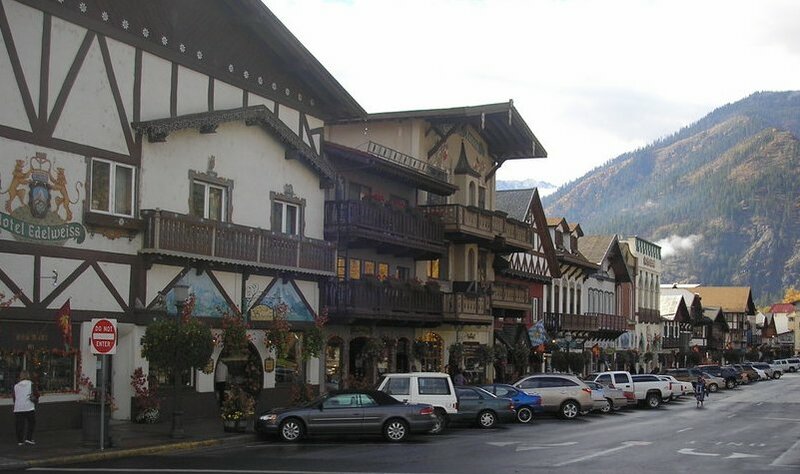 One of the towns we cruised through was the Bavarian berg of Leavenworth, WA. Why that name for a totally Alpine-themed village is beyond me, but it was quite charming. One thing we’ve noticed about this region is the abundance of flowers. They’re very serious about plant life around here. Since we’re old and rather exhausted from the day’s exertions, that may be all I do tomorrow: take pics of all the riotous vegetation. Now let’s see if I can get this published before Comcast pulls the plug for the night. Aug. 25, 8:35 AM – Not good: You know how I’ve been whining about jet lag. Well, Husband and I fell into bed 8:30-9:00 PM last night. And our room in Everett overlooked the pool. And people tend to shriek and holler when they’re having a good time in the water. Plus the AC would explode to life about every 10 minutes, and then quit seconds later. Not that we needed cooling. We needed masking noise for the pool party and a city that makes more noise than SeaTac Airport on a Friday afternoon. We ended up changing rooms first thing this morning. Good: Breakfast. No need to hike to Denny’s this time. The Best Western Cascadia lays out a serious feast. Aug. 25, 2:20 PM – Finally recovered from jet lag, moving to another room, and too much breakfast. We’re heading for attractions at points north. 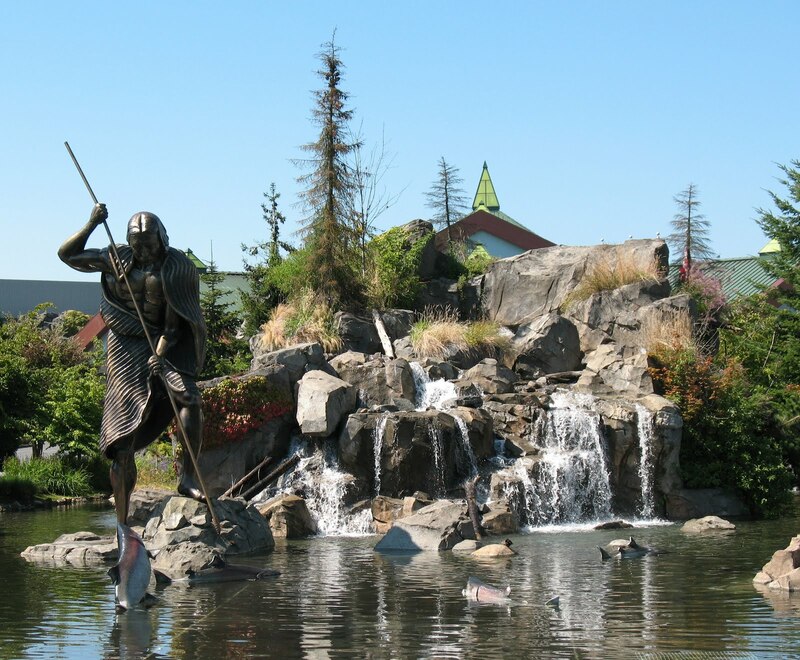 Husband spotted a lavish casino on the Tulalip reservation which offered a great photo op. From there we turned off I-5 to trek east into the Cascade Mountains. Breathtaking! Breakfast finally wore off by the time we reached the tiny town of Darrington. 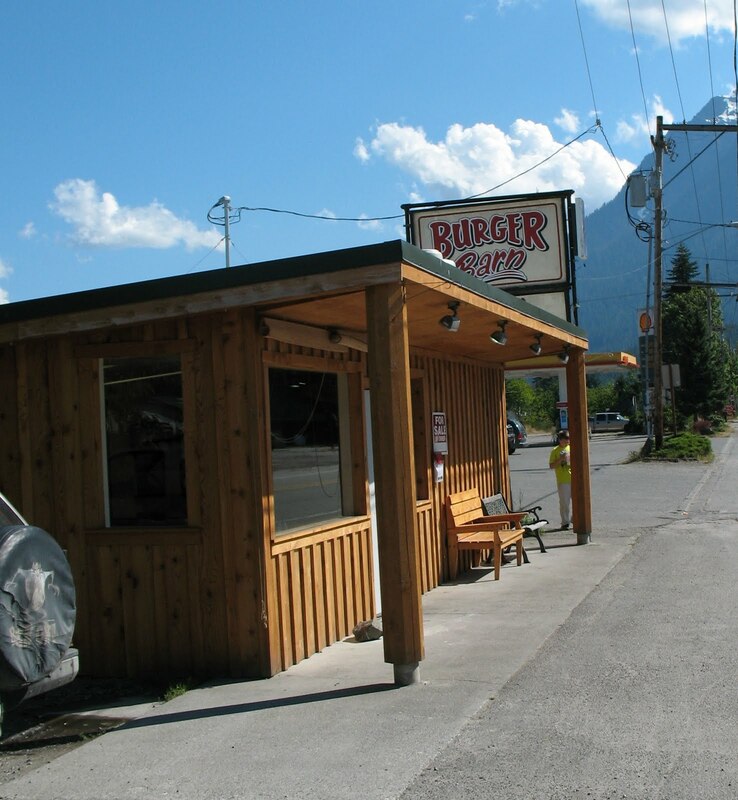 We were a bit wary of the only eatery for miles around - this rustic, 3-table Burger Barn. But let me tell you, friends, this place is a real find. We started with a basket of homey-tasting fries. 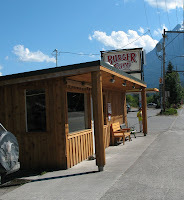 Husband reported his “Famous Burger” was terrific even though served with tarter sauce. My salmon burger came with jalapeňos – an unexpected taste treat. Aug. 24, 1:00 PM. 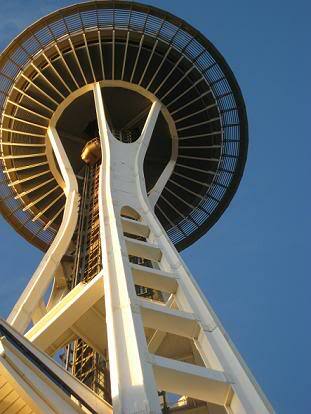 Staring up at the Space Needle in awe and a modicum of terror. An outside glass elevator? You gotta be kidding! But the queasiness from the ride up dissipated with the thrilling view. So much to see! 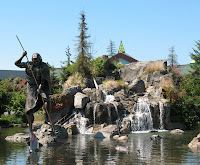 Lots of water, to begin with: Puget Sound, Lake Washington, Lake Union, Green Lake – all bustling with sail boats, ferry boats, parasails, float planes, and way more. Great, snow-capped mountains all around. Despite the touristy attire of the diners, this is unmistakably fine dining. The wait staff, personable and world class professional, wore suits and ties. I had the salmon (seemed apropos) served with wilted pea vines and blueberry chutney. Weird but excellent. Aug. 23, 5:15 PM - Just got to Bush Intercontinental with gobs of time to spare. Got through security easily. Husband was in another line and got the full treatment. Had time to get me a cinnamon dolce latte at an adjoining Starbucks while he was getting dressed. Air Alaska doesn’t have much of a presence here. It shares a counter with Horizon, Air France, and KLM. Sad. Aug. 23, 10:58 PM – That’s Seattle time. My watch says 1:00 AM. It was a lo-o-o-ong non-stop flight. But since we were in the air in excess of 3.5 hours, the airline was obliged to serve us something besides tiny bags containing pretzels, cheddar corn and roasted red pepper strips. For $6 I got a hamburger and a decaf coffee. The meat tasted like it’d been boiled. But we came through much better than I expected. The SeaTac airport was an abrupt change of décor from Houston Intercontinental. There are abstract totems on some of the pillars, the café fronts were stonework and logs, and the shops had rows of plaster (or maybe taxidermied) fish on the walls. But the best part was emerging into the cool air of the Pacific Northwest. This is the perfect place: forests, mountains, and picturesque lakes and rivers everywhere you look. Back in December I did a 3-part blog on the music I play while writing. Last night I entered a new dimension: Fragrance. Scent is a powerful thing. It instantly commands our thoughts, moods, and memories. Aroma inspires, enlivens and transports us as nothing else. And since I’ve always been sensitive to scents, I can’t imagine why I’ve never addressed it before. · Essential oils, which are natural oils extracted from plants and flowers. · Absolute oils, which are highly aromatic, concentrated, oily mixtures extracted from plants. · Synthetic oils, which are man-made scents that duplicate a particular fragrance. · TOP NOTES are the first thing you smell - fresher and lighter than mid or base notes. · MID NOTES are the heart - they define the character, or body, of a fragrance. · BASE NOTES create longevity. They are heavier, sweeter, and more long-lasting. First I painstakingly chose the right warmers: A full sized one for my computer room, and a pretty little plug-in for the upstairs bathroom. Then I explored the nose-boggling array of aromas. Wow. There must’ve been over a hundred. Most were well-calculated naturals – botanicals, subtle florals, and herbals - that were wonderfully evocative. 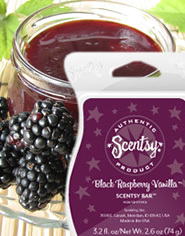 Some, like Satin Sheets, Snow Berry, and Sunkissed Citrus, were lively and stimulating. Or you can mellow out with the likes of Baked Apple Pie, Sugar Cookie, or Mochadoodle. Some were quite masculine, like My Dear Watson, Embers, and Route 66. And there must’ve been a dozen appetizing takes on vanilla. Me? I ordered, among other things, Honey Pear Cider, Mums & Marigolds, and Cranberry Mango. I even got scent hangers for the car. Look ‘em up: https://abbeynewton.scentsy.us/Buy. It’ll blow your nose. Do I perhaps detect a craving for sanity and simplification? Duh. Look at us. Economic crises. Dysfunctional homes, joblessness and desperation as far as the eye can see. That may account for a trend I’ve been noticing both in the news and as I peruse the Top 100 Entertainment/Book blog list. 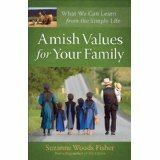 This morning alone I’ve encountered three posts reviewing books on Amish and Mennonite values. In the last month I’ve seen TV specials on these simpler and more successful lifestyles, plus a number of online articles extolling the merits of reducing your living space to 380 sq.ft. Hmmm…the modern-day hippie equivalent of dropping out? No, we are grownups looking for a reasonable way to survive. And no government program or feeling of entitlement is going to hand it to us. So…we’re looking to a subculture with a workable system. We’re tired of being owned by material things. We can no longer afford the liabilities imposed by former prosperity. In short, we want to get real. 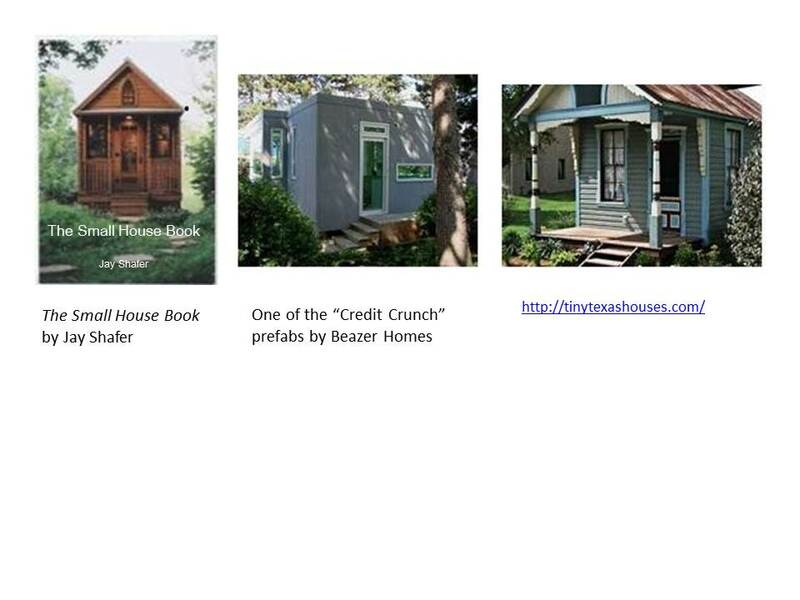 Judging from the popularity of these homely and minimalist concepts, we may actually be onto something. SFX overload everywhere these days. Spectacular scenes of unmitigated destruction and carnage all over TV and the big screens. 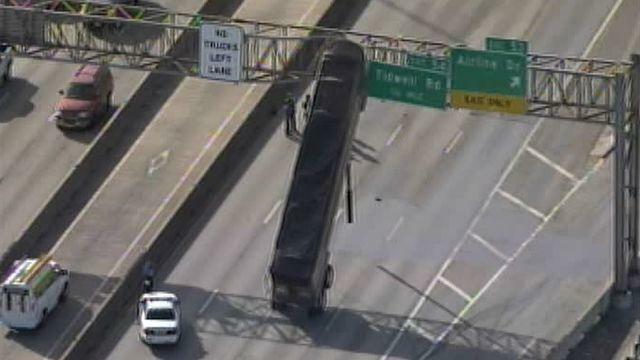 So check out I-45 just north of Airline Drive in Houston. At this writing, they still don’t know how the heck this happened. About all I can do is send you a link to the news story. You see, when a major movie comes out, we wait and wait until all the crying kids, twitchy teens, and the rest of the crowds have all seen it. Then we venture out on a weekday for the earliest showing. Of course, we love the kid stuff, too, so if there’s a daycare van unloading in front of the ticket window, it’s an automatic postponement. But this time it was perfect. It was 10:30 AM Thursday at the local AMC 30. Yes, there were quite a few cars in the parking lot, but the few kids trooping in with their harried moms made for the Smurfs or Captain America. Most the couples heading toward the sleek circular ticket terrace were like us: graying with a slight arthritic limp. 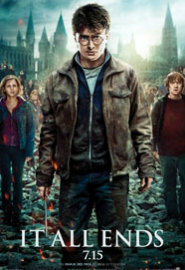 Harry Potter and the Deathly Hallows, Part 2 did not disappoint. Normally I’m not big on distopian settings, which pretty much describes the wizarding world with the rise of Voldemort. But by now the characters are so near and dear I want to follow them no matter what. J. K. Rowling is that brilliant. The kids, meaning Harry, Ron and Hermione, are still endearingly young. But now, on the run against deadly evil, they display incredible resourcefulness and quick-minded maturity. The real hero, of course, is Hermione. Not taking anything away from Harry. He stands up and does what he needs to do. Ron’s value, aside from his loyalty and great lines, is largely accidental. He just happens to pop up at the right time or overhear some piece of critical info. The point is that they wouldn’t have gotten one meter on their way without Hermione’s cleverness and attention to detail. The most important thing for me is the emergence from tragedy and near total destruction to the fresh and new. In the end, a new generation melts through the pillar at Kings Cross Station at Gate 9 ¾ to clamber aboard the gleaming red Hogwarts Express. Gotta love it.